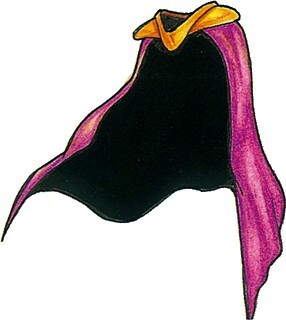 When travelling across Motavia in Phantasy Star II, many women would wear capes as protective gear. This is the Fiber Cape, the most basic of such items. More progressive capes are made out of stronger materials, including the incredibly strong metal called Laconia. This one is clearly flexible enough to be moved by a strong breeze, which is an important quality for dramatic usage of any cape. Although only Amy wears a cape in most artwork, every woman in the party can use these - except for Nei. Perhaps capes do not mesh well with her more agile style of movement.